Bronstein & Weaver, Inc named a Campaigns & Elections Magazine Stanley F. Reed Award finalist for excellence in political campaigning for Montclair, NJ race! - Bronstein & Weaver, Inc.
Bronstein & Weaver, Inc WINS Stanley F. Reed Award for Montclair, NJ race! Many of New Jersey’s professional intellectual class - writers, producers, publishers, and Oscar winners - live in Montclair, NJ. It's a ‘exceptional’ New Jersey town treasured for it’s unique quality of life and an unlikely pick for a knock-down-street-brawl. Yet, the local race for mayor and town council quickly turned into one that received national media attention. Our work and resulting HUGE WIN garnered Bronstein & Weaver, Inc. a finalist for the prestigious Campaigns & Elections Stanley F. Reed award for the fifth consecutive year. We are proud to share this year’s nod with general consultant Henry de Koninck and automated phone vendor CPEC LLC! 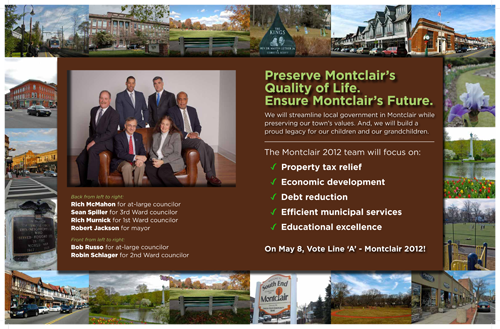 Our client was the “Montclair2012” slate comprised of mayoral candidate Robert Jackson and council candidates Rich McMahon, Bob Russo, Rich Murnick, Robin Schlager, and Sean Spiller. Robert Jackson faced off against Karen Turner, founder of Concerned Citizens for Montclair, and Harvey Susswein, a management consulting executive. Just 14 days before election day, a SurveyUSA poll commissioned by a local news outlet had Karen Turner up 9 points on Jackson and 10 on Susswein - Turner 33%, Jackson 24%, and Susswein 23%. Most insiders believed that Turner would win the race due to her local popularity, ‘soccer mom’ appeal, and serious ability to self-fund. So just how was it that the Montclair2012 ticket swept to office and Robert Jackson won NEARLY 50% of the vote on election day in this stunning three way battle? In consultation with general consultant Henry de Koninck and the campaign, we devised the following strategy: Establish our client's vision for the future of Montclair, challenge Turner’s “progressive” credentials, and bridge the socio-economic divide in our base support to build a winning coalition. While it was clear that we could attack Turner straight out of the box, we judged that it was important to firmly establish Montclair2012’s positive narrative and avoid going negative too early. We tried to strike the appropriate balance and with the initial flights of positive mailers, we defined the election (“It’s about Montclair’s future”) and set up reasonable financial goals for the town that differed from our opponent's platform (“Which Way will Montclair Go?”). This squarely positioned Montclair2012 as the ticket that would preserve the town’s quality of life from generation to generation, and insulated our ticket against Karen Turner’s attack that our candidates were typical “tax and spend” liberals. Turner’s ticket called ‘Real Progress Montclair’ had been trying to position itself as the team for progress. Instead of allowing the ticket that messaging space, our strategy was to paint Turner as an extremist when it came to budget cutting. In the contrasting mail flights, we stripped away Real Progress Montclair’s credibility on the budget issue and asserted that Robert Jackson and Montclair2012 would protect Montclair’s quality of life. Typically, robocalls are not very effective. 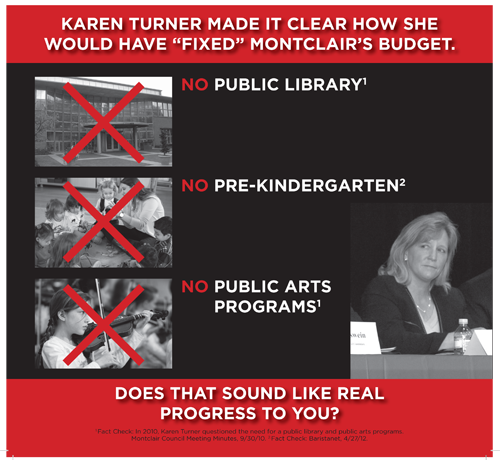 Because Karen Turner was a popular local figure, people did not immediately believe the assertions that this 'PTA mom' would cut Montclair programs. We had to do more to prove our case. To illustrate our point, we presented a recording of Karen at the public meeting in which she lambasted the town’s treasured services, and dropped the call the weekend before the election. The New York Times called the call ‘vicious’ but really it was just Karen in her own words. And, when a candidate goes on record at a public meeting, voters know that it’s fair game. And, if you go to this link, you can listen to Karen Turner "in her own words" lose the election. Robert Jackson, took 50% in the three-way slug-fest, swinging 30 points in his favor in the final two weeks. 4 out of the 5 council seats were won by Montclair2012. And, it’s now likely that Montclair will now keep its public library, arts programs, and maybe even have some shade trees too! As if that weren’t enough, we are proud because it’s the story of how Bronstein & Weaver, Inc. WON a Reed Award for a fifth consecutive year!